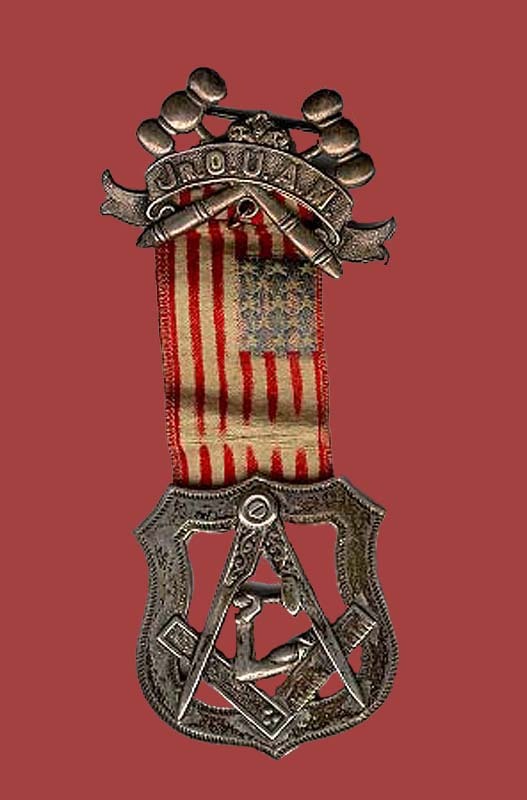 Badge with ribbon from the Junior Order of United American Mechanics, founded in Philadelphia in 1853, and established as an idependent secret society in 1885. The badge contains symbols of the mechanics' trade--crossed gavels, calipers and a t-square--although by 1885 the members were not, for the most part, mechanics. A secret society rather than a labor organization, the JUOAM excluded people based on race, gender and national origin durng most of its existence. As a nativist organization it originally working against competition from Irish, German and Roman Catholic immigrant workers, and later was concerned about Jews, blacks, Roman Catholics and women.